Unicorns might not be real, but the love for them certainly is. Help your friends and family celebrate those magical horses with a Technicolor gift. Everyone needs a pair of shoes that go with everything, and these simple but charming flats, could be that pair for your recipient. The white ballet flats show off a pair of smiling unicorn faces and an embroidered rainbow outline. The insole of each slipper says "cute to the core," and we can't disagree. How does Santa Claus have time to make it to all those children's homes in just one night? Unicorn magic, of course. Give your friend this acrylic yarn sweater to wear while opening presents. This light-up unicorn bust is motion-sensored, illuminating for 20 seconds every time it detects movement. Besides making for a great hallway light, it also has a long horn, which can be used to hang keys or jackets. The light is powered by three watch batteries and can be mounted with screws or magnets. This 20-inch tall LED light can cycle between 16 different colors and four lighting modes. It's also remote-operated so users can change their glowing friend's color from across the room. If the giant unicorn light is too intimidating, you can also opt for a smaller version that can sit in the palm of your giftee's hand. These battery-powered alternatives—available in pink, purple, yellow, and white—stand at 5 inches tall, making them a portable companion. Why should little kids have all the fun with their light-up sneakers? 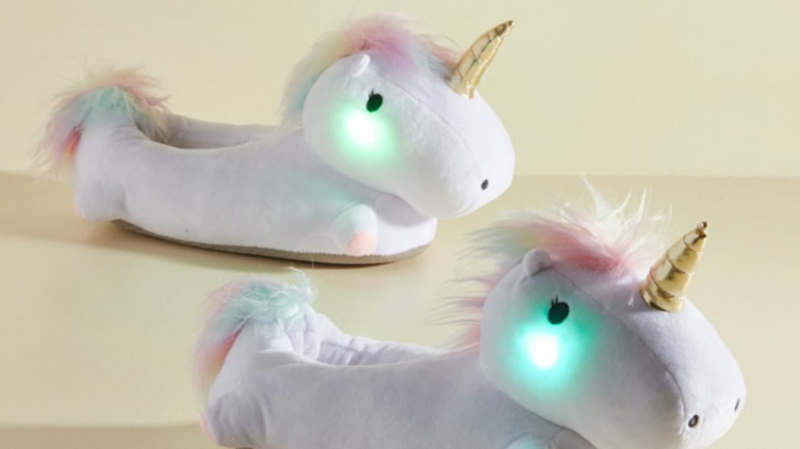 These battery-powered slippers have light-up cheeks that glow with each step the wearer takes, making the trip to the fridge all the more magical. Sometimes people's love for unicorns is less than pure, as evidenced by Firebox's popular gin liqueur called "Unicorn Tears." The magical—yet arguably inhumane—concoction comes with little bits of silver that make the bottle look like a snow globe when you shake it. The sparkly drink will be perfect for clinking glasses with fellow villainous drinkers. At 80 proof, you're likely to forget all about the poor unicorns whose tears were harvested for your shimmery drink. Staying hydrated will be a lot easier with a glass that's hard to put down. Give your friend this set of beautiful unicorn glasses that come with black and white unicorns painted on the sides. There's four in each set, so you can hope to use one when you pay a visit. If you have a loved one who's been rocking those plain generic bandages, give them a stocking stuffer that will brighten up their medicine cabinet. Each tin comes with 15 band-aids featuring pictures of unicorns crying as well as a special mystery toy. Help your favorite baker add a touch of magic to their cupcakes with these colorful toppers. Each set includes 24 cupcake holders and 24 toppers. You might also want to buy your recipient a bottle of sparkly sprinkles to really sell the look. Have a friend who wishes they were a unicorn? Gift them a gigantic plush unicorn head. There's a mesh liner to allow the wearer to see and a subtle opening under the snout for easy breathing. Feeders for birds are more common, but squirrels need to eat too—and they might as well put on a good show for anyone who's watching. This comical feeder transforms any unsuspecting squirrel that stops by into a tiny unicorn. String lights are a quick and easy way to add a little dazzle to otherwise unassuming rooms. That's why these hot pink unicorn lights are perfect for anyone in college or their first apartment. The 10-foot wire comes with 25 plastic lights and a battery pack so it can be wrapped around a banister or coiled into a glass jar. At first glance, this looks like a real cupcake, but tell your recipient not to eat it! It's secretly a bath bomb that comes with its own rubber ducky. Once the cupcake is tossed into the bath, it creates a soothing mixture that softens skin and makes the bathroom smell like cotton candy. The rubber ducky doesn't dissolve of course, and can be used again for other baths. This 18-inch necklace features a pendant made with translucent acrylic and gold glitter, a gold-colored chain, and a blue tassel.